Using an effective resume template could result in interviews with prospective employers. Prospective employers look for a clean, crisp, detailed resume that is easy to read and error-free. Using effective resume templates can help you format your resume in a way that will catch employer’s attention. Job seekers who are interested in reformatting a current resume or writing one from scratch can rely on these effective resume tips. 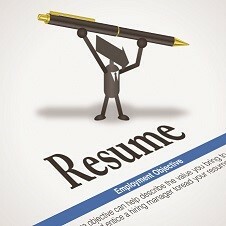 Below you will find several suggestions on how to format a resume in a way to get noticed by prospective employers. Before understanding how to style a resume, you must first understand the different types of effective resume templates that are available to use. Chronological Resume: This resume template starts by outlining previous work history then providing a brief outline of your educational background and any specific skills you may possess. This information should be presented in chronological order. Each section on this resume template has a brief outline of your job responsibilities, description of the employer, and skills used on the job. A chronological resume is often relied on by those who have vast work experience, as it allows them to show off their accomplishments first. Functional Resume: A functional resume benefits those with little or no work experience, or those who are freshly out of college. This resume focuses on highlight skills that have been obtained either through educational work, volunteer work, or hobbies/interests. Now that you understand the different types of effective resume templates, it is important to understand how to style that resume. The following are some of the suggestions provided by recruiter Bill Radin for how to create a stylized resume that is effective in landing a job. (Bill Radin is an experienced recruiter and also specializes in recruiter training). The key is to grab the reader’s attention without getting flashy. Leave the fancy fonts and photos out of the resume. Job seekers can capture the attention of a prospective employer by using bullet points, bold and italic fonts, and indentation. It is important to keep your resume short and to the point. Try to keep a resume between 1-2 pages. Try to word phrases with actual value instead of being vague. This will show prospective employers just how experienced you are a particular job. For example, say ‘provided customer service to 50 customers a day’, as opposed to ‘provided customer service to many’. It may seem like a good idea to be extremely vague about when you’ve worked, especially if you have been out of work for a while, but it does not look professional on a resume. Try to be as clear and detailed as possible about when you’ve worked for a previous employer. Listing degrees and certifications is important, but only if they have honestly been earned. Try not to exaggerate degrees or certifications that you have earned. And certainly do not lie about graduating from a college when you have not graduated. Capturing the attention of a prospective employer can be tough, especially when they have hundreds of applicants. Using these effective resume templates and style tips can help you create a resume that is attention-grabbing and helpful in landing you a job interview. Source: Bill Radin, recruiter and recruiter training specialist.